Cacao Pow is heavy, but PACKED with protein, fiber, and heart-healthy, anti-inflammatory omega-3s. And let's not forget, the raw cacao and Dutch cocoa are both very rich in antioxidant flavonoids and magnesium, adding to the overall nutrient-denseness of this mega-delicious liquid meal! Warning: rich, velvety, and luxurious–Chocolate Covered Cherry is sure to cause swooning. Perfect for any sweet-tooth craving, this Liquid Meal may very well become your new favorite dessert. The Dutch processed cocoa enhances the sweet and tart cherry, and the addition of almond extract delivers a soft and supple undertone to this Liquid Meal experience. Whoever said plant-based enthusiasts and vegans can’t enjoy chocolate were clearly mistaken. Our raw cacao and Dutch cocoa are both 100% plant-based & nutrient-dense forms of chocolate. Specifically, they are both very rich in antioxidant flavonoids (and the essential mineral, magnesium), even more so than blueberries, red wine, and green tea! Surprising, no? But, let’s not forget the other star in this liquid meal - the sweet, dark cherry, which is thought to help cure headaches, even migraines. Now that’s what we call a guilt-free treat! Our take on the famed Pina Colada, this is our version of the frozen cocktail, sans the booze and the sugar crash! It’s a refreshing, tropical, creamy treat for those days you really want to escape to a tropical paradise… which is like everyday, right? This liquid meal packs great refreshing pineapples flavors paired with creamy coconut goodness, it’s absolutely divine. So, enjoy this tropical paradise in a cup, you’ll be happy you did! Our Coconut Colada is jam-packed with the anti-inflammatory, vitamin-C-rich pineapple, so you know it's going to be delicious and nutritious! Pineapples are said to help lower your risk of age-related macular degeneration, ease pain of arthritis, and improve inflammatory skin problems such as acne and eczema. Moreover, pineapples are great sources of a unique protein-digesting enzyme, bromelain, which provides even more anti-inflammatory benefits and immune support, but mostly promotes healthy digestion! We’re all in, how about you? Imagine your favorite blended frappe ONLY BETTER! Cold-brewing coffee brings out the flavor of the beans, completed with naturally sweet brazil nut milk and our Dutch cocoa and raw cacao powders. 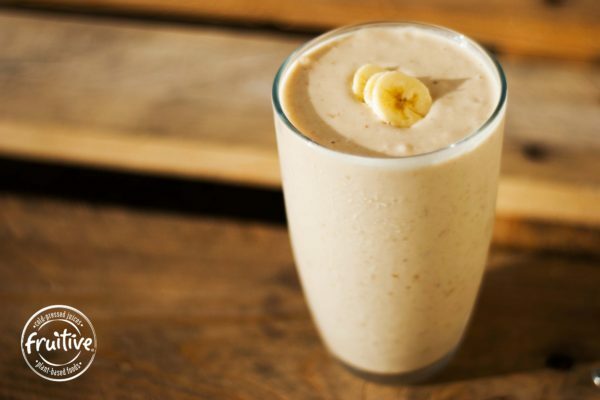 Banana and peanut butter have always been the perfect pair and this is no exception in this liquid meal! Dates give the sweetness you crave without the sugar crash you hate and leave you feeling energized and ready for what’s next! Coffee Date is PACKED with protein, fiber, and heart-healthy, anti-inflammatory omega-3s. Cold-brew coffee is not only delicious, but also is rich in antioxidants and aids in digestion. Chia seeds keep you fuller longer, aid in weight loss, fight belly fat and bloat, as well as carrying insulin regulating properties that promotes blood sugar maintenance. Wow! And let's not forget, the raw cacao and Dutch cocoa are both very rich in antioxidant flavonoids and magnesium, adding to the overall nutrient-denseness of this mega-delicious liquid meal! Craving something that reminds you of childhood (but is actually good for you)? Dream Date is here! Just like the peanut butter and banana sandwiches you ate as a kid, this liquid meal is perfectly crafted and satisfying! Dates add a natural sweetness to this complete liquid meal while peanut butter provides the protein and energy you need for the day. No added sugar here, just natural goodness! We believe whole-heartedly that the right ingredients can make anything healthy AND delicious! In Dream Date, bananas and dates promote healthy digestion, provide cardiovascular support, lower high blood pressure, and are a great source of vitamins and nutrients. Combined with protein-rich peanut butter and calcium-rich and antioxidant packed cashew-milk, this liquid meal is not just for kids, but the perfect treat for adults too! The F.I.T. is definitely a top seller, and highly recommended by all Fruitive staff! It’s a peanut butter lover’s dream, super creamy and decadent, yet healthy in every way, shape, and form. Specifically, it’s our go-to post-workout liquid meal. It’s rich in protein, potassium, and manganese to help build lean muscle and replenish our bodies with electrolytes to prevent muscle cramps. Dare we say, it’s the best protein shake out there?!? Make it even better and add a scoop of protein powder or a boost of chia seeds. The F.I.T. is a great post workout treat, rich in protein and potassium, it helps build lean muscle and prevent muscle cramps. It’s also a great source of fiber and healthy fats, aiding in weight loss and healthy digestion. So, why not supplement your exercise regimen with this filling meal, and reap the benefits!?! The Peaches & Greens Liquid Meal is a fantastic way to get a quick helping of greens! More specifically, it’s a great way to get your kids to drink some greens, without the complaints. You can’t taste the spinach at all, but trust us, we put heaps of it in there. Although this liquid meal is our greenest one, we still highly recommend it to everyone and anyone, even our beginners! So, if you’re in the mood for a green juice, but want something a little more filling, Peaches & Greens is your answer! The star of this liquid meal is the heaping amounts of spinach! Spinach is rich in vitamin K, C, and A, supplying our bodies with a multitude of health benefits, including but not limited to, promoting healthy skin, eyes, bones, and immune systems! Interestingly enough, when spinach is in its cooked, juiced, or even cut form, it is actually at a healthier state. This is because we are breaking down some of its rigid cell walls, and not only aiding in the digestive process of the leafy green, but also enhancing the bioavailability of some of its phytonutrient antioxidants. Probably the most traditional fruit flavor pairing ever… Strawberry Banana. It’s delicious, creamy, and super sweet, yet also amazingly healthy. Strawberry Banana is our beginner liquid meal that was specifically developed with kids in mind, but there are no age restrictions here, don’t worry! Obviously, the familiar, bold flavors of strawberries and banana are prevalent in this drink, but our secret ingredient, vanilla extract. Trust us, it really makes a difference and adds extra sweetness without the added sugar! So? What are you waiting for? Satisfy that inner you with this celebrity flavor pairing! Our Strawberry Banana Liquid Meal is jam-packed with vitamin C and potassium, making it the perfect liquid meal to boost our immune systems, as well as replenish our nutrients and prevent unwanted muscle cramps! Not to mention, bananas are also rich in fructooligosaccharide, a prebiotic that helps the body absorb calcium. While strawberries add the additional benefits of folate, iodine, and magnesium. Yum! Some things were just meant to be together, and we discovered that turmeric and mango were just that! Sweet and vibrant, Tumerango is a blend of earthy flavors that are perfectly complimented and balanced by deliciously sweet fruits. Blended with orange juice and banana add more flavor to this delightful liquid meal, making it one you’ll want over and over again! We make a conscious decision to use ingredients that are as good FOR you as they are flavorful! Turmeric has a unique nutrient, curcumin, that is known as the plant-based Advil. Known for its anti-inflammatory properties as well as cancer-fighting benefits, it also helps to regulate insulin levels, lower LDL “bad” cholesterol, provide cognitive benefits and much more! Sweet mango offers anti-aging and anti-inflammatory benefits, as well as being great for the skin and eyes! Orange juice is an excellent source of vitamin C while bananas promotes healthy digestion and offer cardiovascular support. Talk about fuel for what’s next! Wellness Warrior was designed with antioxidant-richness in mind; hence it’s packed with all the trendiest superberries on the market! It’s the perfect liquid meal for just about anyone, adults and kids alike. So, we challenge you, stand in your Warrior 1 pose and sip on its greatness, you’ll be happy you did! The Wellness Warrior Liquid Meal flushes your system with tons of vitamins, minerals, and phytonutrient antioxidants. It’s an immune boosting, brain powering, beautifying, and strong detoxifying liquid meal that is sure to be enjoyed by the warrior within!